Internet has become a big phenomenon and everyone wants to benefit from it. Even though it offers a vast scope for doing well in various fields, it still poses some challenges that have to be overcome. There are many people who claim that it is easy to make money on the Internet; however, the truth is that succeeding on the Internet is as easy or as difficult as in an offline business. 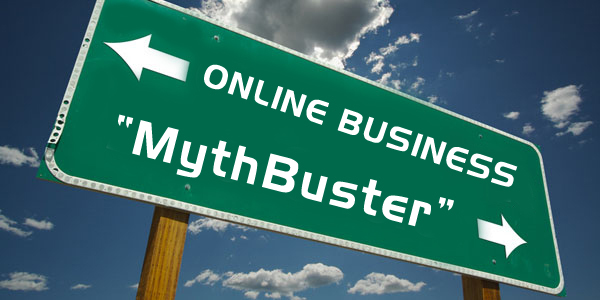 The top 10 myths associated with online business have been busted to ensure that all can enjoy and reap benefits from the e-revolution. Even though it matters how a website looks, but it is more important what it offers, as this will make or break it on the Internet. There is no point in spending thousands of dollars on a website that hardly offers anything unique from other websites. The biggest advantage Internet offers is that if you have a great idea, you can virtually start with nothing and become successful. There are great examples like Google and Facebook, who started with nothing but have become billion dollar businesses now. Every type of business needs publicity and a presence. Internet is one of the best platforms and offers great benefits to every business. Even bookshops, flower shops and your neighborhood bank are present on the Internet as they can derive a lot of benefit from the presence. You need to advertise to make your presence felt online, but if you know how to do Search Engine Optimization effectively you can easily get a lot of traffic to your website. It does not mean you have to spend a lot of money but you need to be intelligent in the way you spend the money. This is one of the biggest myths as it is a proven fact that people are more willing to deal with a small and efficient company than with a big and bloated one. If you are good in what you do, you can turn your small size into a big advantage online. You may have a great product or an amazing concept; but, it is important to remember that it will take time and efforts to succeed on the Internet. Even the most successful websites have taken time and diligent efforts to succeed on the Internet. You need to remember that there a lot of people selling business plans online; however, it is not easy to convert all of these plans into a success story. It is not easy to adopt the same strategy that has been used by others and still succeed in your business. Nothing can be farther from the truth than this statement. Internet business will need a lot of time and endeavors to succeed and anyone who feels that he/she can reap instant rewards will gain nothing but disappointment. It is important to have sound knowledge before starting an online business. If you do not know anything about the business you want to start online, there are more chances that it will end in a failure. This is a big misconception and you need to remember that it is your own foresight and perseverance, which is important to ensure the success of your online business. If these so called experts are as good as they say, they would have developed their own successful online businesses. Consideration to the above points would ensure that you can significantly improve your chances of success in an online business. I am not sure about the last one. Your going to need help especially if your not an expert on the internet. If you have the budget, get the help. It’s like any other business, who you pick to get help will make all the difference. Another one is – all you need are links. Content is king! Never forget it.